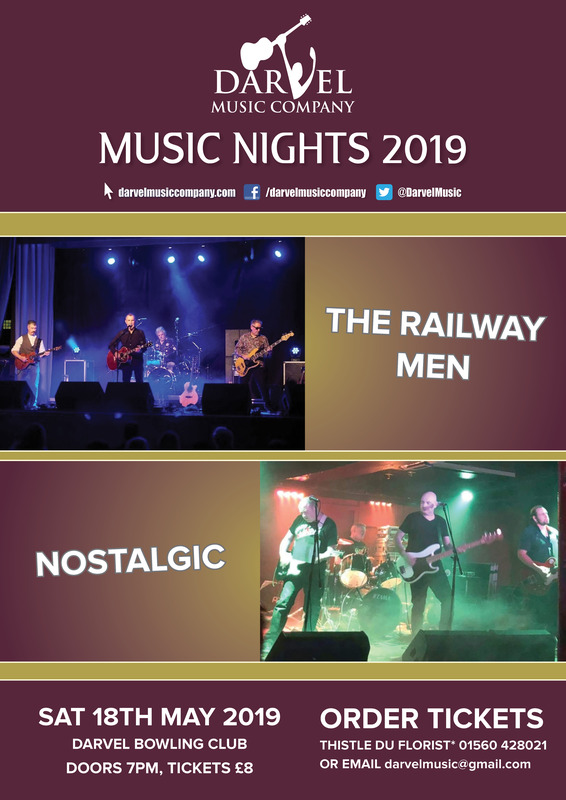 The Railwaymen and Nostalgic at Darvel Bowling Club. Tickets on sale mid March at Thistle du Florist or email darvelmusic@gmail.com to book your tickets. The Darvel Music Company was formed to promote music culture, music development and 'live' musical performance within Darvel and other communities within East Ayrshire. The inaugural meeting was held on 30 April 2008 and took over the organising and running of the prestigious Darvel Music Festival. The company is not for profit and is run by music loving volunteers - no-one gets paid! "Our new committee members all have a passion for music and are experienced in event management, marketing and public relations". We have also formed strong partnerships with innovative arts and cultural groups across East Ayrshire. In return we will add your logo and/or advert to our website and feature you on our new Facebook page and on large screens during each concert. We are hoping that 100 music friends will either provide us with a single donation of £60+ * (please go to our shop) or consider a monthly standing order (please see below), of £5 (or multiples thereof) ** to support us in our continued efforts to bring great acts to Darvel over the next few years. *Any one-off donation of £60+ will entitle Friends of Darvel to 1 FREE concert ticket immediately. **After 12 monthly standing order payments are received, Friends of Darvel will be entitled to 1 FREE ticket to a show of their choice. Any one-off donation of £250+ or monthly payment of £20+ will entitle you to a FREE advert on our website and at our concerts. You will also be entitled to a FREE pair of tickets for a show of your choice if we receive an immediate one-off payment (please go to shop) or after 12 monthly payments (please see below).